Telefax straight from a heated cypher in the early 2000s, we are proud to present to you: “Mind, Soul & Bodies”. Let loose as Dr.Bops and his alter ego take you on a journey of thumpin beats, sharp observations and deep experimentation. Crack a cold one, pack a bowl and immerse yourselves into a comically harsh world as seen through the lens of Mad Skabenga. 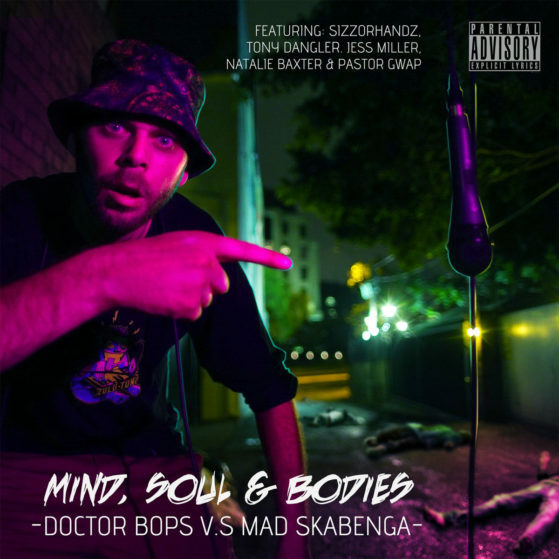 Written, composed, performed, recorded, produced and mixed by Doctor Bops A.K.A Mad Skabenga. All copyrights reserved 2017 / Artwork by Mike Iller & Bops / Mastered by Dugguh @ Sonic Weaponry. A massive thanks goes out to the featured artists!